Got Salad? 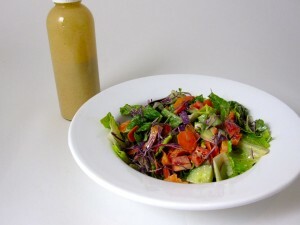 Make these EASY Awesome Raw Vegan Dressings! I recently created a couple of dressings, with nutritional powerhouses Garlic and Ginger, that have become staples in our house. 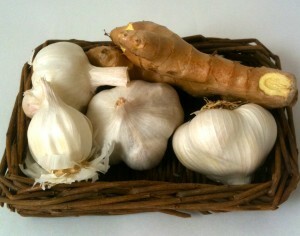 I’m fond of saying that garlic is a king when it comes to nutrient dense seasoning and flavoring, and ginger is his queen. You just can’t go wrong with them because they’re amazing at punching up flavor, and they’re both loaded with important nutrients. The two dressings below are very similar except for one ingredient – ginger. I tested them with my usual testing panel and both dressings pass with flying colors. My mom went to Whole Foods today to stock up on the ingredients so she can make these every week – my step-dad licks the blender container clean every time I make it. They’re easy, delicious, and they go with pretty much everything. We enjoy them dressing any salad, especially salads with romaine lettuce. They’re also fabulous on steamed broccoli and as a dip for other veggies. Got vegan pizza? Dip it in one of these… toast is great slathered with it too. I even love making a bowl filled with black beans and fresh raw produce topped with either one of these. YUM YUM!!! Blend everything until smooth and enjoy!!! Trust me, you will enjoy it!!! * If you use the dressing immediately after making it, the consistency is good. Once it’s been stored in the refrigerator, it thickens up so you might want to add a bit of water at this point and shake it up. Or, just use it in the thickened state and toss your salad really well to cover everything… the water from the salad ingredients will thin it out a bit. For a fabulous variation of this dressing with even more nutritional punch, make my Garlic Ginger Almond Dressing – Simply follow the same dressing recipe above, but add 1 teaspoon of freshly grated and packed ginger. Yowza Yumminess!